Start T01 is a contemporary boys bedroom set featuring a cool desk with integrated drawer units, metal shelves, single bed with upholstered headboard and a fully equipped walk-in closet. Start T02 is a space saving kids' bedroom furniture set for small rooms. 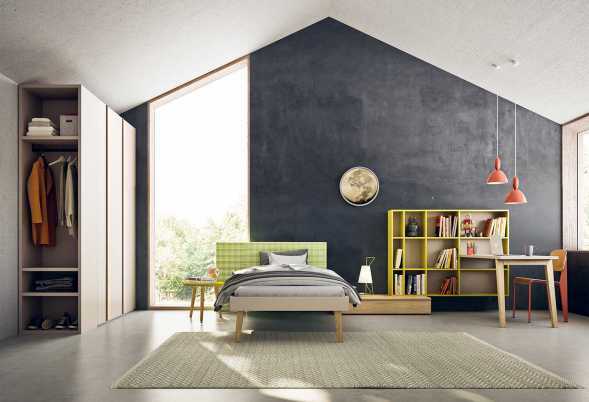 The full group has a corner layout that features a study area, a day bed with trundle and a stylish wardrobe. 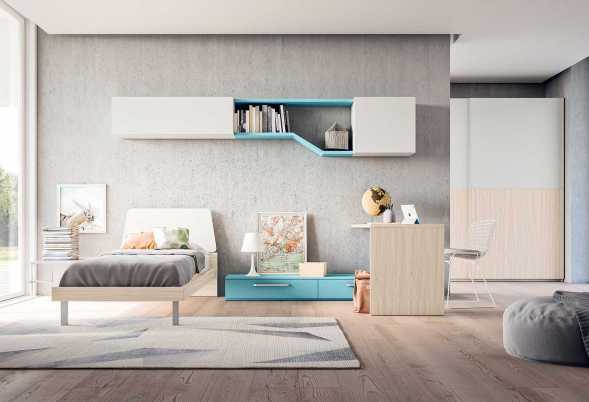 Start T03 offers a single bedroom furniture package that suits a wide age group thanks to its sleek design and huge flexibility. Large single bed, shelving, tv unit, wardrobe and open closet system. 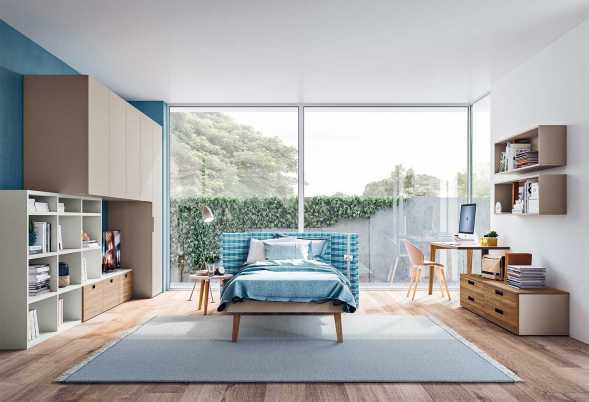 The modern Start T04 is a set of teenage bedroom furniture with open wardrobe, single bed with drawers, desk and shelves. A cool bedroom for a teenage boy or girl, loaded with storage space. Start T05 bedroom set with drawers under bed and wardrobe with desk built in. Including roomy low bed incorporating large underbed storage, extra deep wardrobe and tall chest of drawers. Start T06 is a teenage bedroom furniture set with upholstered bed, wardrobe with external clothes rack, corner workspace area with desk and bookcase. Industrial style with concrete look surface. 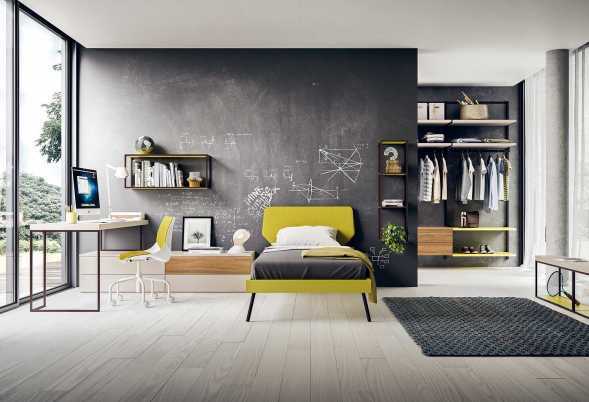 Modern Start T07 teen boy bedroom furniture offers a complete set featuring a single bed, study area with desk, shelving, wall storage and wardrobe with coat rack unit and bookcase. Start T08 white and wood kids' room furniture set in pearl lacquer, elm and pastel blue. Featuring a single bed, desk and drawer units, shelving, two sliding door wardrobe. Start T09 space saving girls bedroom furniture will help you maximize your kids bedroom by making full use of a single wall. The set combines wardrobe, desk, bedside table, shelving and bed. 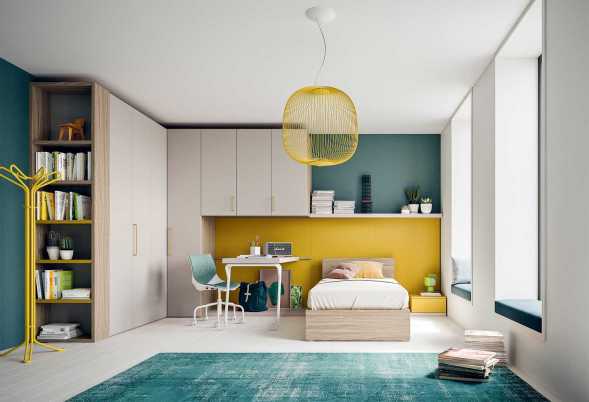 Making great use of space, the Start T10 teenage bedroom set with walk-in wardrobe features a corner layout that incorporates study area with floating desk and bookshelves, wardrobe and bed. Start T11 corner kids bedroom furniture is the perfect solution for a girl's or boy's room. 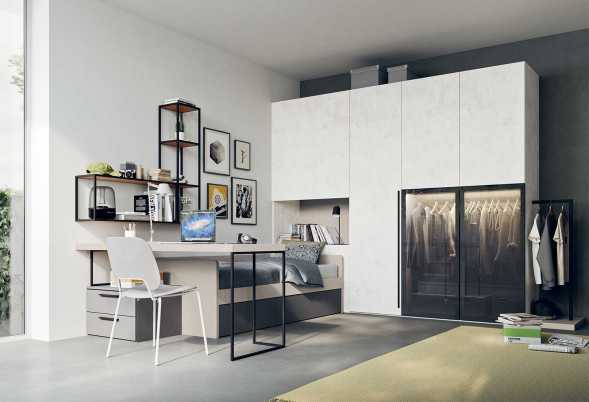 Including modular L-shaped wardrobe suitable for any space, single bed and desk with casters. The boy's room furniture set Start T12 features a single bed, desk and 4 door wardrobe with built in bookcase. This bedroom offers everything a teen boy needs to rest, study and store his clothes. 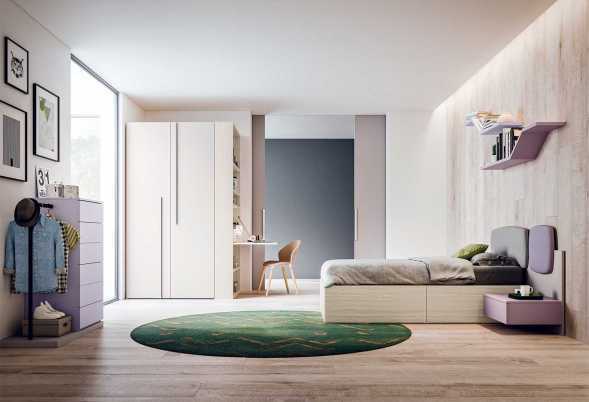 Ideal for a boy and girl shared room, Start T13 is a contemporary bedroom furniture set with two beds and a handleless wardrobe. A multicoloured headboard is built with padded wall panels. Start T14 kids' room furniture set with single bed is designed for little or young ones. Perfectly organized with a large wardrobe, bookcase, workspace with large desk and drawer unit. 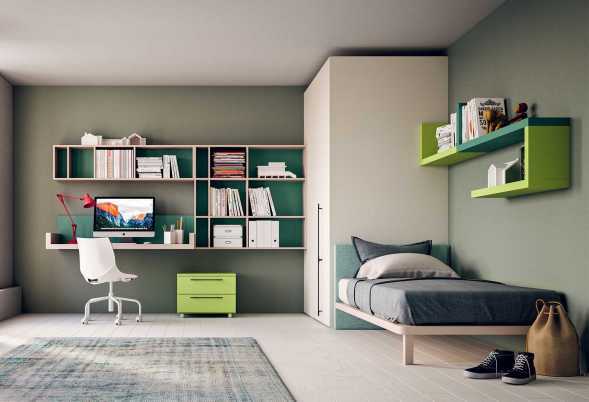 Start T15 is the perfect choice if you need a complete teen boy bedroom with desk, bookshelf, bed and wardrobe. 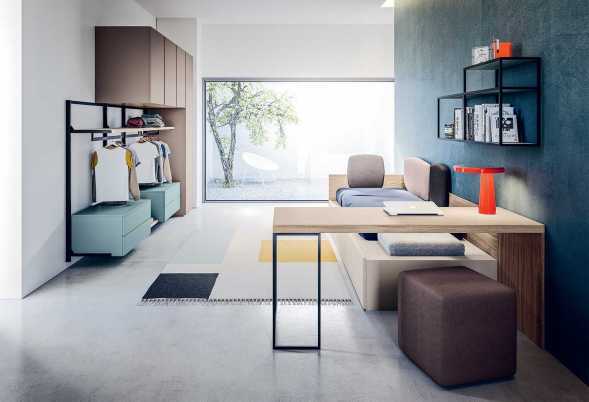 A modern functional design that combines sleeping, storage and studying space.